Matter impacts mind. Proportions are felt, colors sensed and relations between colors, too. Light waves travel and reach the retina – reaching the seeing hearing smelling body. Frequencies translate into something inside: should I call it “vibrations”? It is not purely metaphoric to speak of the “tone” of a color – the inaudible “sound” it emits, the melody and rhythm of a visual work of art, its “music,” its harmony or dissonance. This also brings to mind that there is something that people call synaesthesia – a word derived from the Classical Greek concept synaistesis, that refers to the capability to “perceive jointly” different phenomena that seem to belong to separate categories of the world, and that are normally registered by different and distinct senses. Yes, our senses refer us to a world – the world of touch smell sight that links with and feeds our inner world of dreams and thoughts and emotions, our states of mind, reaching from agitation to grief or joy, or simply tranquility. We all know that dissonance can be fresh and creative, awakening something in us, like a loud cry for help, an alarming (“all'armi” or: “aux armes”) call, a painful shriek or surprised shout. But does harmony or balance put us to sleep? And if so, can that state, close to sleep perhaps, that peaceful state of mind, can calmness and an equilibrium that is reached again, have a healing effect? 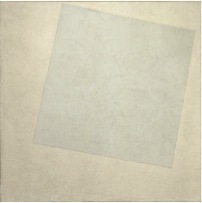 Whether purely black in the way of a monochrome painting, like Malevich's “Black Square” (1915), a strictly minimalist achievement avant la lettre, or exploring the effect of a rectangular white space placed on a white canvas and their minimal differences in tone, as in Malevichs's “Suprematist Composition: White on White” (1918), minimalist works reduce our mental attachment and reference to ideas not related to the work of art in front of us. (2) And they are thus likely to “bracket” or suspend – at least for the moment, under the condition of intense yet calm and concentrated confrontation with the work – our involvement in thoughts and emotions that might otherwise preoccupy us, and our focus on physical things and social relationships (thus class relations) that exist around us. (3) What remains in the center of our attention is the work of art made by the painter: its material way of “being there” – as some say; its unnamable, elusive, perhaps mysterious “essence,” as others maintain. The fact that both interpretations can appear to us as plausible should let us explore this coincidence. The black painting is there; of course we will notice its size, the particular black of the surface, the texture of the canvas. We may even note the way light is reflected, depending on how the work is exposed to it. Focusing in this way on the material quality of the object is not a gratuitous act; the seeming absence of a “narration,” of “content,” of conventional “referentiality” directs us to form, structure, color, the material per se. But then, of course, by way of excluding “the expected” – that is to say: exactly that which was acknowledged as an accepted approach of “serious art” in 1915 – a work like the “Black Square” incorporates in fact an implicit reference: to the expectations it disappoints and the tenets inscribed in the dominant canon that it breaks with. For Viktor Šklovskij, such disappointment of the expected, such a break with the tenets of a canon that would, of necessity, become “automatized,” was a prerequisite for genuine aesthetic perception. 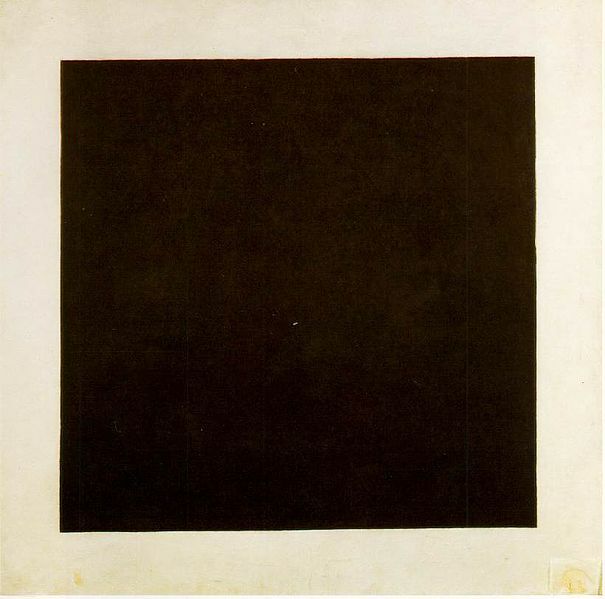 (5)In order to perceive the break with artistic norms and in order to understand this, while we confront a work like Malevich's “Black Square,” we have to do more than to smell, to perhaps feel the texture (with our eyes) and to touch the frame, to lift up the framed canvas and feel its weight. We have to construct a context in our mind, we must think. To think about aesthetic conventions and about the fact that they are being challenged by a work, and even to feel the un-expected (if we are too unaware of art traditions and the changing canon), evolves our mind, thus the “spirit” – as some of us will prefer to call it. Is it then the spiritual that “touches” us (as some say) while we see the work of art? Is it impossible to separate our material sense perception of the material work of art – a work of art that apparently refuses to carry any (explicit) “content” and that insists on being a pure object – from our ability to feel and dream and think? The spiritual “touch” that some speak of may well be the “immaterial” way we are moved by feelings and thoughts and words that form in our mind, which in turn reflect a history of thoughts and ideas, of discourses and utterances which relate, in one way or other, to the observations, conclusions, or merely the expressed “feelings” of Others. Like Paul Klee, Malevich undoubtedly sought to buttress his idealist, metaphysical world view when he created paintings that were object art, three-dimensional due to the frame, but above all: canvas, structure, texture, color, weight, size – devoid of manifest emotional and intellectual content. The spiritual impulse found a material objectivation that became very radical in its aesthetic formulation. Looking back at the predecessors of “minimalist” post-war art, the question arises of course whether their radicalism can still be heightened, and whether anything was and still is left for further exploration by today's artists, in that direction chosen so obviously by Malevich – or in the direction opposed to Malevich's direction that Rodchenko opted for. It is clear that these two painters refuted, in the works here referred to, the sensual richness and the representational character that critics and the public cherished in prior European art. Robert Rauschenberg, White Painting (three panel), 1951; latex paint on canvas, 72 in. x 108 in. 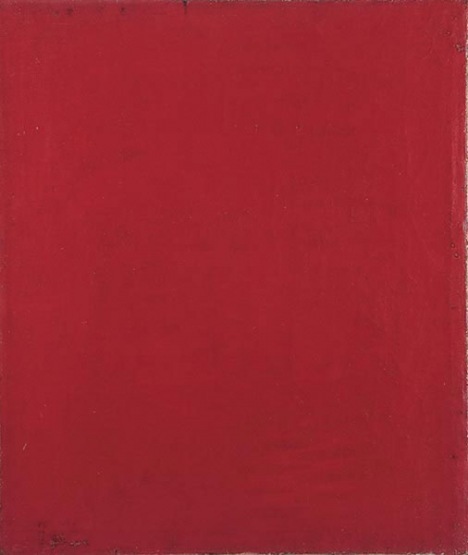 (182.88 cm x 274.32 cm); Collection SFMOMA, Purchase through a gift of Phyllis Wattis. © Robert Rauschenberg Foundation / Licensed by VAGA, New York, NY. 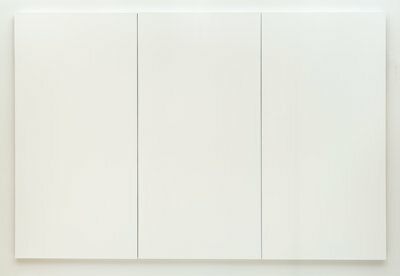 Robert Rauschenberg, White Painting (Seven Panel), 1951. But there was research involved. That easy-coming, intuitive kind of research that let him make this step ahead of combining the panels, and making the viewer aware, not only of the texture of the canvas, and the brush strokes by which he had applied the white house paint color, but also of the frames and thus the panels, and of the small gaps where the panels were joined together. It underlined the object quality, the “materiality” of the work. Thus, with the reputed novelty of Rauschenberg's choice to create paintings by “minimising the subject” in 1950, the avant-garde aura of the Minimalism of the 1960s is put in question, as well. The old problem resurfaces: what is totally new, under the sun? This of course would be an ahistoric way of putting it. The whiteness, thus void, in Classical Chinese landscape paintings has a different philosophic significance and is inserted into an aesthetic strategy that is different from that of either Malevich or Rauschenberg or that of minimalists like Ad Reinhardt and Barnett Newman who produced, if not white paintings, then – more generally speaking – monochrome squares and rectangles that left a mark in recent Western art history. (28) Perhaps we are to obsessed with the idea of innovation and absolute novelty, and should instead watch out for what is specific, in a work of art. What we come across is not always asethetically radical, whether we refer to minimalist works or works that critics place in other contexts. And yet, seeing minimalist works that artists create today, I love to discover the minute qualities that they manifest, I look for and explore their particular beauty. Perhaps such works educate us – helping us to look more patiently, more concentratedly, more closely. It was Šklovskij who, by speaking of the "automatization of perception," made us aware, conceptually, of the decisive difference between true "seeing" that does not simply "confirm" what we think is there and our conventional way of briefly "recognizing" things we think we know – where the quick glance is a matter of the "economy" of perception in everyday life: after all, there exists a history of how we perceive, there exist engrained mechanisms, and 10,000 years ago a hunter confronting a bear had to grasp the situation very quickly. Freshness of seeing matters clearly when we face a work of art. It depends both on the preparedness of the viewer to truly see rather than being content with a quick glance, and on the work that reveals its difference from the expected. It is interesting that Malevich's interest in "essence" (an absolutely idealistic attitude, we have come to believe) was echoed, in a very different way, by the German playwright, thinker and poet Bertolt Brecht. Speaking of realistic representations of a major German industrial corporation, the AEG, with its vast factory in Berlin, Brecht said that the realist who would give us a photographic representation of the "façade of the AEG" would fail to reveal to us "its essence. "(31) Because it was clear to him that an understanding of the social and politico-economic essence of the AEG – and of capitalism – mattered, Brecht developed a new way of "showing things" on stage. He, too, wanted to provoke "a new way of seeing" that would let us suspend engrained, stereotyped, superficial ways of "recognizing" again and again what we always thought was there, even if it wasn't, at least not in the way we thought it was. It was Mondrian, another pioneer of abstraction, who interestingly enough, spoke of the "new man" he envisioned - and this long before the term became a watchword and later on, an automatized, routine slogan in the now defunct USSR. Mondrian said of the "new man" that he hoped the future (and also his art?) would bring about, "When he feels, he thinks - and when he things, he feels. "(32) Mondrian recognized the split that devastated modern man, due in part, to the hegemony of "thought" in the wake of Descartes and Newton, and in part due to the specialization that we can attribute to the mode of production that evolved, first in Europe, then globally, in the Modern Age. Like others, Mondrian sought to heal the wound and thought that art could help us to become full, holistic, non-alienated human beings again. Brecht, I think, would have critiqued Mondrian as naive – but he, too, bet on art, in his case drama and poetry. And he, too, while turning his eyes to the real world, to questions of power and political economy and class relations again, knew full well that the unity of thought and aesthetic perception – the unity of clear rather than fuzzy, stereotyped thinking and clear, beautiful, humane emotions that accompany such thinking – matters intensely. Perhaps the art of Malevitch, and Minimal Art, as well – like so much else that is experimental in the arts – can be understood as prolegomena, as a test phase and preparatory stage, for what is to come, and what we all should hope for and try to achieve: a sensitive art that makes us see, and an art that will not let us close our eyes to what is patently wrong in the world we inhabit. (2) Margarita Tupitsyn, in her book on Malevich and Film (New Haven: Yale Univ. Press 2002) has reminded us of the long-suspected fairly direct connection between “Malevich's early nonobjective experiments” and “the work of a dizzying array of second-generation postwar artists, including Richard Serra, Sol LeWitt, Robert Rauschenberg, Yves Klein, Piero Manzoni, Art & Language, Mel Ramdsen, On Kawara, Komar and Melamid, Ilya Kabakov, and Allan McCollum.” (Kent Mitchell Minturn, “Seeing Malevich, Cinematically,” in: Art Journal, Vol. 63, No. 4 (Winter, 2004), pp. 142. (4) The idealist interpretation of Malevich's works that is still current was of course pre-figured in his own writings. It is remarkable that Malevich thought of his canvases that refused mimesis as “non-objective” when they were in fact devoid of content and reduced to bare material presence. Malevich's view that emphasized the spiritual significance of these non-mimetic works is revealed in his writings edited by Troels Anderson in the 1970s, with later additions offered by more recent editors. (5) See the relevant statements in: Viktor Šklovskij, O teorii prozy. Moskwa 1925; Moskwa (Federacija) 1929; Viktor Šklovskij, Theorie der Prosa (Ed. and transl. by Gisela Drohla). Frankfurt am Main (S. Fischer Verlag) 1966 [192pp. ]; Victor Chlovski, Sur la théorie de la prose. (Trad. du russe par Guy Verret). Lausanne ( L'Age d'homme) 1973 [300pp. ]; Viktor Shklovsky, Theory of Prose (transl. by Benjamin Sher, with an introduction by Gerald L. Bruns). Elmwood Park IL (Dalkey Archive Press) 1991 [XXI, 216pp]. (6) See. Wassilij Kandinsky, Ueber das Geistige in der Kunst, insbesondere in der Malerei. Munich (Piper Verlag) 1912, 5 leaves, 104 pp., 9 plates, and ten original woodcuts. At the time, Kandinsky was influenced somewhat by Rudolf Steiner, the founder of a spiritual doctrine that was inspired both by theosophy and by an idealist reception of popularized "materialist" (and even socialist) ideas. Steiner, who had read (and misunderstood) Marx, focused like many progressive liberals on "the social question" but also - almost as a loner - on a critique of positivist, non-holistic (nicht ganzheitliche) modern medicine. He called his doctrine anthroposophy, because man was to be in its center. That his thinking was attractive to idealist painters was perhaps a result of Steiner's focus on the psychosomatic effects of.eurhythmics (it would influence Mary Wigman, and at least indirectly, Martha Graham) and of colors as well as "organic" architectural forms (something that would influence Hundertwasser later on). Steiner clearly attempted to "bridge" the abstract opposition of "matter" and "spirit" by way of his mystic, spiritualist "theory" and a practice based on his thoughts. As for Kandinsky, he was not alone in having recourse to mystic thinkers; Paul Klee shared his interest in the psychic implications (or the psychic resonance, in the viewer) of such material "phenomena" as colors, visual rhythms, proportions etc. Mondrian was influenced by theosophy in his search for formal balance and harmony. Thus, Kandinsky's evocation of the spiritual in art was in line with the idealist inclinations of many artists around 1910-1917 who, quite helplessly, confronted the socio-cultural crisis of Western civilization and looked for, and in fact, suggested idiosyncratic "ways out" of this crisis. Of course, obscurantist speculation can fructify a poetic mind and lead to fascinating works of art. The question remains what "kernel of truth" (or insight into the profound questions of our time) may surface in an oblique way in speculative idealistic writings and in works of art that are influenced by their ideas.- On the other hand, the political implications of the "spiritualist" turn to "abstract art" and to "the spiritual in art" deserve attention. It was not by chance that Kandinsky's Ueber das Geistige in der Kunst was able to influence a younger generation of painters in the US in the wake of WWII when the Guggenheim Foundation (re-)published it. See: Wassily Kandinsky, On the Spiritual in Art. New York, NY (Solomon R. Guggenheim Foundation) 3rd printing 1946. 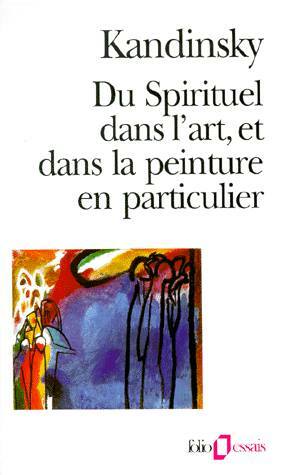 -This publication was followed by: Wassily Kandinsky, Concerning the spiritual in art and painting in particular 1912. New York (Wittenborn, Schultz) 1947, and a French (re-? )edition: Wassily Kandinsky, Du Spirituel dans l'art et dans la peinture en particulier Paris (Éd. de Beaune) 1953. See also the role of the International Committee of the Museum of Modern Art, the role of such museums in pushing abstract art and marginalizing US and European realist artists, and the way US government agencies (from the State Dept. to USIS and the CIA) used funds, connections, and organizational know-how in order to make this strategy succeed. Cf. Peter Coleman, The Liberal Conspiracy: the Congress for Cultural Freedom and the Struggle for the Mind of Postwar Europe. New York (Free Press) and London (Collier Macmillan) 1989; Pierre Grémion, Intelligence de l'anticommunisme: le Congrès pour la liberté de la culture à Paris (1950-1975), Paris (Fayard) 1995; Maria Eugenia Mudrovcic, Mundo nuevo: cultura y guerra fría en la decada del 60. Rosario (Beatriz Viterbo) 1997; Kristine Vanden Berghe, Intelectuales y anticomunismo: la revista “Cuadernos brasileiros” (1959-1970). Leuven (Leuven Univ. Press) 1997; Frances Stonor SAUNDERS, Who Paid the Piper? The CIA and the Cultural Cold War. London (Granta Books) 2000; Giles Scott-Smith, The Politics of apolitical culture: The Congress for Political Freedom, the CIA, and post-war American hegemony. London and New York (Routledge) 2002; Olga Glondys, La guerra fría cultural y el exilio republicano español: 'Cuadernos del Congreso por la Libertad de la Cultura' (1953-1965). Madrid (Consejo Superior de Investigaciones Cientificas) 2012; and the book reviews by D. Howard, “L'anti-totalitarisme hier, aujourd'hui et demain: Frances Stonor Saunder, Who Paid the Piper. The Cultural Cold War, the CIA and the World of Arts and Letters. – Pierre Gremion, Intelligence de l'anti-communisme. Le Congrès pour la liberté de la culture à Paris, 1950-1975. – Ulrike Ackermann, Sündenfall der Intellektuellen. Ein deutsch/französischer Streit von 1945 bis heute,” in: Critique: revue générale des publications françaises et étrangères. Issue no.647/2001, pp.259-278. (8) See: Ernst Bloch, Philosophische Grundfragen. Teil 1: Zur Ontologie des Noch-Nicht-Seins: ein Vortrag und 2 Abhandlungen. Frankfurt am Main (Suhrkamp) 1961; see also: Robert Paris, “Utopia e scienza nell' immaginario socialista,” in: Il socialismo e la storia : studi per Stefano Merli / a cura di Luigi Cortesi, Andrea Panaccione; scritti di Aldo Agosti, Luigi Cortesi, Andrea Panaccione et al. Milano (F. Angeli) 1998. (11) See Ernst Bloch, Avicenna und die aristotelische Linke, Berlin (Rütten & Loening) 1952. (13) Walter Benjamin, Das Kunstwerk im Zeitalter seiner technischen Reproduzierbarkeit. Frankfurt am Main (Suhrkamp Verlag) 1963; also: Walter Benjamin, "The Work of Art in the Age of Mechanical Reproduction (1936)," in: Neil Badmington (ed. ), The Routledge Critical and Cultural Theory Reader. London (Routledge) 2008, pp.34-56. (14) I'm referring here to the White Paintings, especially White Painting (7 panel), White Painting (3 panel), and White Painting (4 panel). (16) Concerning Rauschenberg's first exhibition of White Paintings, see: Roni Feinstein, "The Unknown Early Robert Rauschenberg: The Betty Parsons Exhibition of 1951," in: Arts Magazine (New York) 59, no. 5 (Jan. 1985), pp. 126-31. Regarding the black paintings, see for instance "“ROBERT RAUSCHENBERG: BLACK FIELDS OF EXPERIMENTATION," in: Stephanie Rosenthal (ed. ), Black Paintings [Exhibition catalogue for the exhibition Black Paintings: Robert Rauschenberg. Ad Reinhardt. Mark Rothko. Frank Stella, at the Haus der Kunst Munich]. Ostfildern (Hatje Cantz) 2006. The catalogue text notes that "[f]rom 1951 to 1953 Rauschenberg created three largely black group of work, […. ]the first, the 'Night Blooming' series, immediately on returning to Black Mountain College. "(p.27) See also: Roni Feinstein, “The Early Work of Robert Rauschenberg: The White Paintings, The Black Paintings, and the Elemental Sculptures,” in: Arts Magazine, Vol. 61, no. 1 (Sept. 1986), pp.28-37; and: Roni Feinstein, Random Order: The First Fifteen Years of Robert Rauschenberg's Art, 1949–1964. Ph.D. diss., New York University, 1990. (17) Malevich, just as – in a different sense – Rodchenko were imbued with the radicalism that was virulent at their time, in the context of the society they were part of. 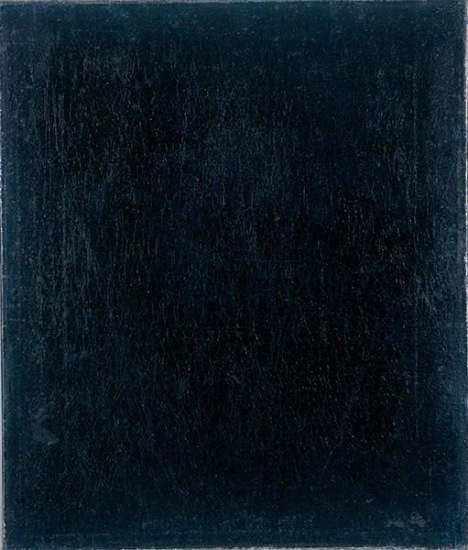 When, in the late 1940s and early 1950s, North American painters like Clifford Still and Robert Rauschenberg reverted to Malevich's monochrone Black Square and his much more complex White Painting, the ideologically intense atmosphere of the period European artists (and Russian artists, in particular) experienced between 1914 and 1925 had given way to an “anti-ideological” climate, the climate that flourishes in the market place, the climate that sheltered the American Dream of individual freedom, consumerism, and of “Anything goes...”. (18) While I prefer to speak here of seriality, the author who wrote a short introductory piece on Rauschenberg on the website of the New York Guggenheim Museum refers to Rauschenberg's “conception of the works as a series of modular shaped geometric canvases,” thus emphasizing the modular quality at the expense of seriality. See: N.N., “Robert Rauschenberg”, in: http://pastexhibitions.guggenheim.org/singular_forms/highlights_1a.html. (19) B.W.Joseph writes that Robert Rauschenberg urgently entreated his New York gallerist, Betty Parsons, in 1953 to give him the opportunity to have a second exhibition that year – featuring the white paintings. “As he explained to Parsons, he considered his White Paintings 'almost an emergency'.” Branden W. Joseph, “White on White,” in: Critical Inquiry, Vol. 27, No. 1, Autumn, 2000, p.90. (21) “Much of Rauschenberg’s practice was based on the idea that what the artist may or may not have been feeling is unimportant […].” Vincent Katz, “A Genteel Iconoclasm. Robert Rauschenberg,” in: http://www.tate.org.uk/context-comment/articles/genteel-iconoclasm. (22) In Roni Feinstein's view, the White Paintings and the Black Paintings were indeed also a reaction to the influential teacher at Black Mountain College, Josef Albers: "[T]these works represented Rauschenberg's response to Color Field Painting [...]" (Roni Feinstein, ibidem, p.37). 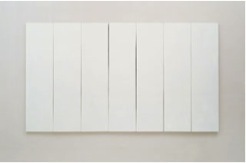 It is difficult to agree with Feinstein, however, when she adds that works like White Painting (seven panel) represented "a moment […] of (relative) discipline and control." Unless, that is, we give very much emphasis to the word relative. Rauschenberg obviously reacted to the paradigm offered by Josef Albers' way of working, which relied very much on control, rigour and discipline. The panels Rauschenberg did between 1950 and 1953 simply seem less spontaneous and more controlled than some of his works of the 1960s and 70s. There was nothing faintly similar to Albers' approach in the way Rauschenberg applied ordinary cheap white house paint to the canvas, and the way he put together the panels can only be described as careless and sloppy. It was an act of revolt – against admired abstract expressionists like De Kooning (insofar as it implied the rejection of a way of painting interpreted widely as "self-expression"), but also against the respected teacher. (24) B.W. Joseph thinks that the letter to Parsons (“the only statement about the White Paintings [by RR] that we have from this time”) “reveals Rauschenberg in a state of transition. It marks the end of what he termed a 'short lived religious period' […].” B.W.Joseph, ibidem. (25) Various authors have noted the close link between Robert Rauschenberg's White Paintings and the silent piece by John Cage. Cage, however, in contrast to Rauschenberg, was already “[u]nder the sway of the Buddhist aesthetics of Zen”: “interpret[ing] the blank surfaces as 'landing strips' or receptors for light and shadow, [he] […] was inspired to pursue the corresponding notion of silence and ambient sound in music. His response [was the piece called] 4'33" (1952) […. ]” N.N., “Robert Rauschenberg”, in: http://pastexhibitions.guggenheim.org/singular_forms/highlights_1a.html. (26) Most critics see Yves Klein's "IKB 191" (created in 1962) and his other blue monochromes as works that made him a “pioneer in the development of Minimal art.” (Yves Klein became famous for patenting his blue - a fact that points to the close connections of modern art with the art market and the particular "logic" underpinning commodification.). If we want to speak of pioneers, apart from Malevich and Rodchenko, we should not forget a number of paintings Barnett Newman did in the early 1950s, or the fact that Rauschenberg's teacher at the Black Mountain College, Joseph Albers, started “[i]n 1950, at the age of 62, [...] what would become his signature series, the Homage to the Square. Over the next 26 years, until his death in 1976, he produced hundreds of variations on the basic compositional scheme of three or four squares set inside each other, with the squares slightly gravitating towards the bottom edge.” N.N., “Josef Albers. Study for Homage to the Square 1964. Display caption, December 2012,” in: https://www.tate.org.uk/art/artworks/albers-study-for-homage-to-the-square-t02312/text-display-caption. As to Rauschenberg's innovative introduction of the White Paintings, it is above all the close look at the works created around 1950 that lets us discover their relative "newness" or novelty. But it is difficult to agree with a statement which claims that "[i]n the white canvases Rauschenberg "swept away" the entire history of painting as a preparation for rediscovering texture and structure [...]" (Stephanie Rosenthal (ed. ), Black Paintings, p.32). (27) N.N., “Robert Rauschenberg”, in: http://pastexhibitions.guggenheim.org/singular_forms/highlights_1a.html. (28) I'm thinking here also of works done in two colors, like Barnet Newman's Eve (1950) that introduces a narrow, almost rectangular stripe on the left margin of a rectangular painting done otherwise in the way of a monochrome work featuring a subdued, somewhat brownish red. We can feel that the surface of the painting is carefully "dynamized" by the fact that this narrow geometrical, comparatively darker, geometrical vertical "ribbon" of brownish violet is a bit wider on the top than it is is on the bottom of the canvas. But in fact, the very existence of the "ribbon" suffices already to gently "dynamize" the reddish, rectangular, otherwise monochrome painting These nuances were in fact presaging what would become known as Minimalist Art. But so did the gaps between Rauschenberg's panels in his early White Paintings and the visible carelessness of his application of house paint. - It is difficult to speak of meaning when we see such paintings. But seeing Newman's Eve, it is as if I hear a warm, serene, radiant song. Poems can be like that, too. (29) It's indeed obvious that you have to look closely in order to get a sense of how these works are and what "they are about." In an article published in Mark Amsler's book Creativity and the Imagination, Donald A. Crosby and Ron G. Williams point out how Rauschenberg was reflecting "the changes that take place in persons and ultimately in society when we learn to see with “fresh eyes,” eyes less constrained by habit and preconception.”" Not only did this artist search for new materials and new ways of incorporating them in the works he created but he apparently hoped that these works would trigger a fresh vision. See: Donald A. Crosby and Ron G. Williams, “Three Case Studies,” in: Mark Amsler (ed. ), Creativity and the Imagination: Case Studies from the Classical Age to the Twentieth Century, Cranbury NJ (Associated University Presses) 1987, p.212, footnote 44. (30) Rauschenberg, during the 1960s, revealed a skepticism that in some way was the heritage of those US liberal and left-wing writers and artists who became disillusioned in the late 1940s. In a text titled "The Artist Speaks," he declared, “We know no better than anyone else how to handle the metaphysics and practice of worldly power. We know even less, since we have not been in the slightest involved with it.” (Quoted by Fabozzi, ibidem, p.68) It was a perfect subjectively valid justification of "apolitical art."